Planning a big event? The right special effects can set the scene brilliantly. If you want to create the perfect atmosphere for your celebration, whether you’re looking for something fiery and flamboyant, chic and classy or bold and bombastic, let us help you choose the best special effects. 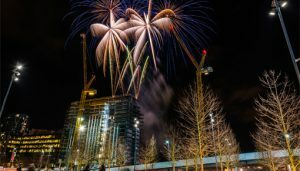 It’s the moment that can set things off with a bang; the way you celebrate New Year’s Eve will set the mood for the year to come. Traditionally, a spectacular firework display is de rigeur when Big Ben chimes twelve, but alternative effects, such as light shows accompanied by music, can be equally impressive. Impress your clients and spoil your staff; make your corporate event the talk of town. Whatever the occasion for your company shindig, inject some glamour with special effects. A water projection screen is a fantastic way to draw the attention during a presentation, while confetti and firework displays will bring everyone together to honour your company’s achievements. Don’t forget to big up your business where you can with a selection of branded products. The end-of-year ball is the big, standout event of the academic year. It’s a time for students to let their hair down and party in style – so you’ll need to source high calibre effects for your event that live up to these extravagant expectations. Fountains and fireworks, rain curtains and bubble tubes will all get first class reactions from May Ball revellers. Whether you’re organising a festival, an open air concert or a garden party, the great outdoors gives you lots of scope for special effects. Pyrotechnics can add drama, glitz and sparkle to any outdoor occasion, with dazzling bursts of colour and light filling the sky. 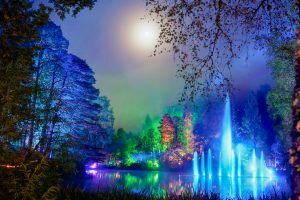 Outdoor illuminations can create a truly magical atmosphere which will show your environs in a whole new light; see how we created a stunning enchanted forest for a sensational outdoor concert. At an award ceremony, all eyes are on the stage. It’s an occasion that’s all about fanfare and spectacle, so the pressure is on to put on a sensational show. With audiences typically including TV viewers and social media observers at home, you’ll need effects that look good from all angles. Rain effects, confetti and pyrotechnics can all be employed to provide the wow factor your audience is expecting. Make your wedding an occasion to be remembered, with some breath taking and beautiful special effects. Elegant fountains can act as a centrepiece to your venue, while blasts of confetti will get the celebration started in earnest. Whatever the effects you choose, you can guarantee your wedding photos will look amazing. So, you’re planning something a little bit different and need some extra special effects for your event? Here at Entertainment Effects we’re always up for a challenge. 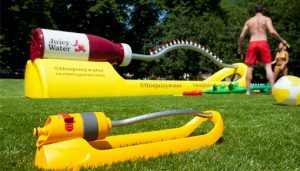 We’re proud of our track record in designing bespoke and inventive SFX solutions for a host of happy clients including Innocent Drinks who commissioned the World’s Biggest Sprinkler. Whatever you’re looking for, we can offer a solution: just contact us to discuss your requirements and we’ll take it from there.